The City student body has unveiled a brand-new all-singing, all-cheering mascot. City Wolf, the University’s latest member, bared its teeth for the first time at a launch event at CityBar on Wednesday. The Central City All Stars cheerleading team were there to welcome the mascot, alongside dozens of students. 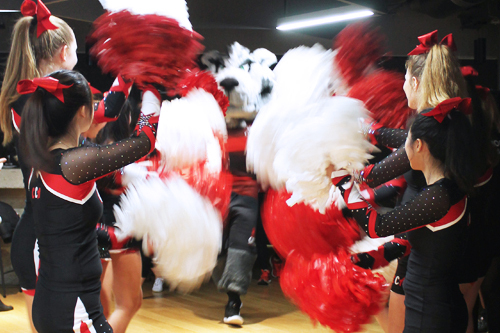 The 7 foot wolf, dressed in a Team City sports kit is now the official student mascot and will support the students, attend sports games throughout the year and spread wolfpack cheer around campus. City Wolf is the brainchild of a group of students who wanted to create a new sense of identity among students and create a buzz on campus. The movement to create a new mascot began last year and was led by Yusuf Ahmed, who was then Vice President of Activities at the Students’ Union. A number of different options were considered and put to a vote. Finally, after weeks of planning and decision-making, City Wolf was picked to represent the student body. Bill Thompson, Head of Sport and Leisure Services emphasised that City Wolf was for everyone – not just the sports teams who came up with the idea. City Wolf is a big sports fan and will of course be supporting our students, attending matches and cheering on our sports teams. But that doesn’t mean our wolf is just a sports mascot, they will be attending non-sporting events too. You can join the wolfpack by following @CityUniWolf on Instagram and Twitter.